Nail stamps have turned manicures into artwork, and this bohemian design is no exception. Combine purple polish with silver metallic powder and a touch of black paint for an intricate design with personality and flair. When using a nail stamp, it’s important to use stamping gel instead of regular gel polish. Stamping gel is thicker and more pigmented, which gives designs a better finish. Just like regular gel polish, you need to cure the design with a UV or LED lamp, and you must clean the stamping plate, scraper, and stamper after completing each nail. Skipping this step will cause your stamping plate to clog up, and the designs won’t be as crisp. Watch the video tutorial to see how to complete this pretty look step by step. 1. Apply one coat of purple gel polish to nails, then cure them with the UV or LED lamp. 2. Brush the latex tape peel off cuticle guard onto the skin around the nails and let it dry. 3. Paint a layer of no wipe matte gel top coat onto the nails, then cure them with the lamp. 4. Dip a sponge makeup applicator in the metallic silver powder, then press the powder onto the stamper. 5. 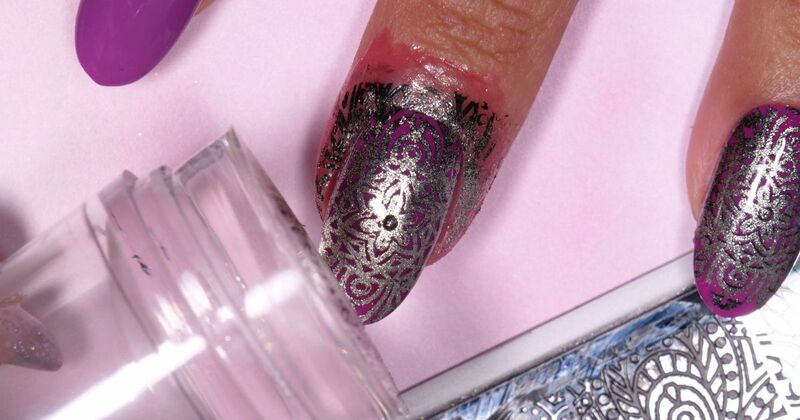 Use a toothpick to apply a single dot of black stamping gel to the center of each nail. 6. Apply black stamping gel to the edge of the stamping plate design. 8. Stamp the design onto the nail, then cure the polish once more. 9. Brush the excess silver powder off the nail with the fluffy brush. 10. Apply top coat to the nails, then cure with the lamp. 11. Remove the cuticle guard with the tweezers.